The Mk XII was the first Spitfire powered by a Griffon engine to go into service. The first of 100 Supermarine built production models started appearing in October 1942, and in total, two RAF squadrons were equipped with the model. Mk XIIs were manufactured from Mk VC and Mk VIII airframes: early production aircraft had the fixed tailwheels, and small elevator balances and had a single 85 gallon main fuel tank, giving a short range of little over 380 miles (610 km) on internal fuel. All were fitted with the larger, pointed tip rudder. The last 45 or so Mk XIIs, were based on Mk VIIIs with two wing fuel tanks, each containing a maximum fuel load of 14 gallons, and featured the larger horn balances, retractable tailwheel and undercarriage legs with torque-links and the four spoke wheels. A later model IFF was fitted, replacing the aerials from the tailplane tip to fuselage with a rod aerial under the starboard wing. Another important feature of the Griffon engine Spitfires was the entirely flush-riveted finish which was progressively introduced on all Spitfires. The single-stage Griffon engine (II or IV) gave the aircraft superb low and medium level performance, although the Mk XII's performance declined at higher altitudes: because of this all production aircraft had"clipped" wings. In comparative tests with a Mk IX it was 14 mph (23 km/h) faster at sea level, but above 20,000 ft (6,100 m) it had become slower. 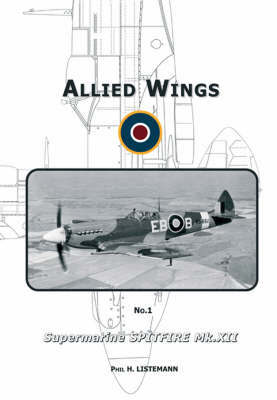 Handling, however, was considered to be better than previous Spitfire marks, and the clipped wings conferred excellent manoeuvrablity through enhanced aileron response. At low altitude it was one of the fastest aircraft in the world; in one speed trial a prototype Mk. XII (DP845), piloted by Jeffrey Quill raced ahead of a Hawker Typhoon and a captured Focke-Wulf Fw 190 to the amazement of the dignitaries present. However pilots found it difficult to exploit this advantage in combat as German pilots were reluctant to be drawn into dogfights with Spitfires of any type below 20,000 feet (6,100 m). When the Mk XII was able to engage in combat it was a formidable fighter and several Fw 190s and Bf 109-Gs fell victim to it. The Mk XII's speed advantage at lower altitudes again became useful near the end of its front line service in Summer 1944, in which it shot down a respectable number of V-1 Flying Bombs. The Mk XII variant was retired in September 1944.